C-clamps and top beam clamps are intended for securing a standard threaded rod to the top or bottom of an I-beam, wide-flange beam or bar joist. Side beam connectors allow to secure a threaded rod to the side of a wooden or metal beam. These clamps are used in combination with threaded rod and provide the means to support pipe (see pipe hangers), strut channel and equipment. The 905-038-PL from PHD is a 3/8” Black Side Beam Connector. It secures a standard 3/8" threaded rod.. The 345-03-EG from PHD is a 3/8” Galvanized Steel Top Beam Clamp w/ Locknut. It secures a standard 3.. The 350-012-PL from PHD is a 1/2” Black Top Beam Clamp w/ Locknut. It secures a standard 1/2" thread.. The 250-038-PL from PHD is a 3/8” Steel C-Clamp w/ Locknut. It secures a standard 3/8" threaded rod .. The 905-012-PL from PHD is a 1/2”” Black Side Beam Connector. 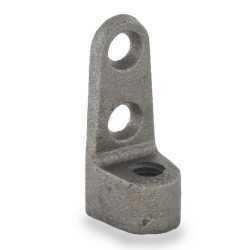 It secures a standard 3/8" threaded ro.. The 250-038-EG from PHD is a 3/8” Galvanized Steel C-Clamp w/ Locknut. It secures a standard 3/8" th.. The 350-012-EG from PHD is a 1/2” Galvanized Top Beam Clamp w/ Locknut. It secures a standard 3/8" t..